Mom and I have been talking about ordering pizza from Papa John's for a few days now. The reason? We're not that crazy about it. Now I know that sounds strange, but both Mom and I like to give everything a fair shot, even if we've been let down in the past. Since we'd never officially reviewed Papa John's, we decided to be brave and order a couple of pies for dinner. She called the Broadway location at 5:35 p.m. and spoke with a very friendly, knowledgeable man. By 6 p.m., the pizzas had arrived. Now, since the subtotal comes to more than one and a half pizzas, I figured out that they must have charged us for the garlic dipping sauce ($.59) and banana peppers ($1.50) that they stuck inside each pizza box. Thanks, but we didn't ask for these and shouldn't have to pay for them. After Dad gave the delivery guy $27 in cash, he brought the pies inside. When we opened the boxes, we thought that both pizzas looked and smelled delicious. With paper plates in hand, we all sat down to dinner. We tried the white ricotta pizza first, which had a blend of four cheeses and a ricotta cheese sauce. After trying it, we all came to the same conclusion - it was blah. For having so many different kinds of cheese, we expected it to have more flavor. 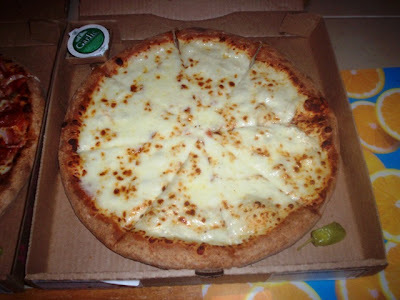 We've had multi-cheese topped pizzas before and they were usually quite tasty. The pizza didn't taste bad, it just didn't taste as good as we'd hoped. The Meatza pie had a lot of flavor due to the four toppings, but the sauce was a little overwhelming. It was as tangy as we remembered from the first time, which is why we didn't care for Papa John's originally. Mom found the pizza to be a little on the greasy side, but that's to be expected when it includes four extremely fatty meats. The Meatza was tastier than the white, but had a bitter aftertaste because of the sauce. On the whole, we feel that the crust of the Papa John's pies are quite doughy. In fact, the dough makes it almost impossible to eat more than two slices - even though we tried. It is strange how Mom, Dad, and I all came to the same conclusion when we all have very different palettes. Both Mom and I agreed that Papa John's offers some pretty good deals, but you have to make sure to read the fine print. For example, they have a new promotion where you can buy one large pizza and get the second free. However, it is for pickup customers only. Also, there are some coupons circulating with great deals, but they are for a limited time (sometimes only 30 days). There is a fantastic deal that is going on through the rest of the summer called the 4-4-4 Super Value Deal. You can order three 10" one-topping pizzas; three medium subs; or one 10" one-topping pizza, cheese sticks, and garlic Parmesan bread sticks all for $4.44 each. Papa John's isn't a sit down pizza place. The chain is along the same line as Domino's - strictly delivery and carryout. They offer several types of pizzas ($12.99-17.99) including chicken Alfredo, garden veggie, BBQ chicken, rustic Italian, Smokehouse bacon, spicy meatball, and many others. They also have a wheat crust option for those who are trying to stay away from carbs. Papa John's offers sandwiches staring at $4.99 such as meatball, chicken Parmesan, veggie, Italian, and chourico and peppers (local only). Appetizers include wings and chicken strips ($6.49), cheese sticks ($5.99), bread sticks ($5.49), and a few dessert choices. Although we didn't hate our dinner, I think we're done with our taste test of Papa John's. We've had their pizza about four times now, and each time we keep hoping that it will be better. Mom and I definitely feel that Papa Gino's is the best delivery pizza chain in the area, with Domino's coming in second. Unfortunately, that leaves Papa John's pulling up the rear. If it weren't for the doughy crust and tart sauce, we may have felt differently. However, I think the Papa John's recipe is here to stay, and that is probably why this will be our last time ordering this pizza. 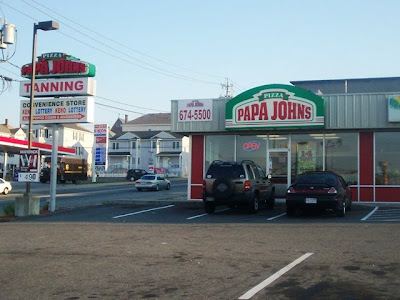 This particular Papa John's restaurant is located at 167 Broadway in Fall River. 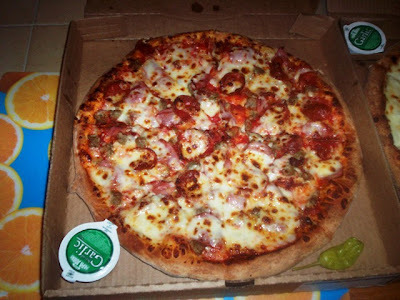 For more information, call (508) 674-5500 or visit the Web site at www.papajohns.com.